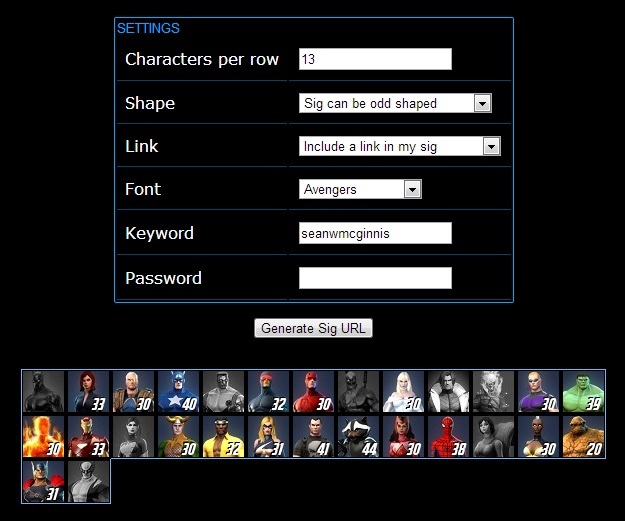 Welcome to my (admittedly crude) tool for generating a custom roster sig for Marvel Heroes. Step 1: For each hero that you own, go through the list and select their costume from the dropdown in the left column. Step 1a: If you want the hero to be grayed-out, select "Unavailable" (the first item in the dropdown). If you do not want the hero to show up at all, select "Do Not Display" (the last item in the dropdown). Step 2: For each hero that you own, enter the current level of that hero in the text box in the right column as an integer. If you do not currently own a hero, leave the box blank. If you enter words or random punctuation, something will probably explode -- that's on you. Step 2a: For heroes that are using the prestige system (prestiging? ), enter their level as the cumulative number of levels they have acquired. So if you are level 5 with a green name, enter "65". If you are level 22 with a purple name, enter "202" (I think). Step 3: If you want to use some of the snazzy option, look at the next section of the manual. If you want the bare basics, leave the other controls alone. Step 4: Press the "Generate Sig" button. Your sig should show up at the bottom of the page. More importantly, some markdown should show up in the textbox labeled "Markdown". Step 5: Copy the markdown from the textbox at the bottom, and put it in your forum sig. Either select all of the text in the white box with your mouse like a neanderthal, or click in the box and hit "Ctrl-A". Then you can either right-click and select "Copy" (making you little better than an ape), or hit "Ctrl-C". 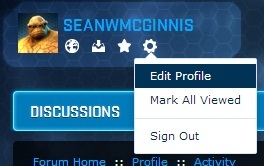 Step 6: To do this, first click on the little gear beneath your name on the forums. Step 7: Select "Edit Profile" from the menu. Step 8: Select "Signature Settings" from the menu on the left side of the screen. 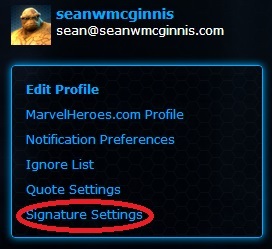 Step 9: Delete whatever inferior sig was in the "Signature Code" previously by select all of the text and hitting delete. Step 10: Paste your new, glorious sig code into the box. Then click "Save". 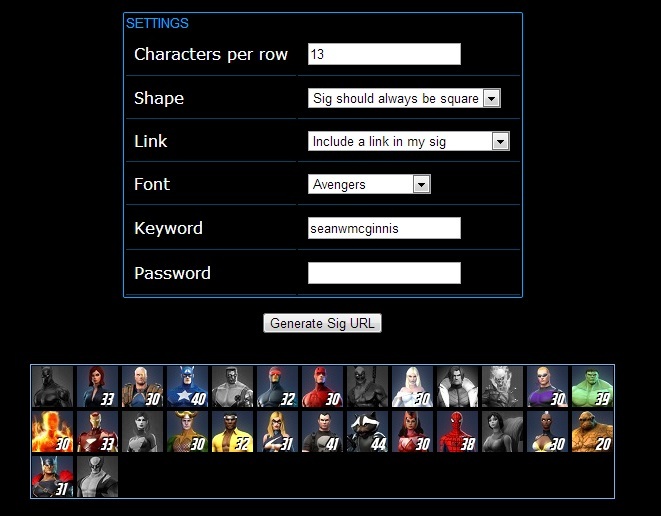 Step 11: Post on the forums, comfortable in the knowledge that all who read your post will know the exact level and appearance of your entire roster. Revel in this feeling! Step 12: If cookies are enabled, your data should be saved; this will make it less painful to update your sig when you level up, though you will still need to copy the new markdown to the Forums. If you want to make it super-less-painful, read "Instructions Part 3". Below the roster is a "Settings" section that I told you not to look at in Part 1. You may now look at it. There. Okay, that's enough...look away. Fill out these options and then click "Generate Sig" -- the preview and the markdown will change to reflect your settings. Thing 1: Set the number of characters per row. By default (currently), this tool will produce a sig with two rows -- half of the displayed characters on top, and half on bottom. You can override this behavior and make it put as many characters per row as you want (as long as it is greater than 1). Type in the number of characters you want per row in the textbox. Thing 3: Promote this site. No doubt, people will ask "Hey, where did you get that majestic sig?" When you grow weary of answering this question, enabled the "Include a link in my sig" option to place a link to the message board thread in your sig. You will have to update the markdown (see Part 1) to complete this change. Thing 4: Change the font. The default font is terrible. You can select one of a number of heroic fonts on this option. This will change the font that your level numbers are rendered with. Thing 5: Set a keyword and password. This is the ultimate is sig luxury; look at the next section to get details. Step 1: Type a keyword into the "Keyword" textbox. This is like a username -- a unique identifier that is linked to your keyword. If you enter one that is not unique, you will need to select a different keyword (or guess the other person's password, at which point you can overwrite their sig -- you varlet, you). Step 2: Type in a password. This isn't your credit card information, and you will notice that this site is not secure. Don't user a username and password that is linked to any other accounts -- I'm salting and hashing the passwords, but I don't want it on me if your car gets repossessed. Step 3: Click the "Generate Sig" button. The sig is generated. Notice that the markdown is significantly shorter (unless your keyword is, like, 200 characters long). Step 4: Update your sig on the forums, as per Part 1. Step 5: When you level up, come here and update your sig. You will need to enter the same keyword and password, but you will notice that your sig automatically changes. Step 6: IF YOU FORGET YOUR PASSWORD...well, tough. Pick a new keyword and re-update your sig. Since you enabled cookies (you enabled cookies, right? ), you just need to update your sig on the forums with the new keyword. This ain't your office and I ain't your network admin. That's it! Let me know of any problems via the forums. This thread is the best place to post bug reports, feature requests, and lavish praise. Important: Credit to zztodd on the forums for the images; I only wrote this code and the sig-generating code, he has done all of the hard work.